Sunday March 24th 1878 I did some of my share of the work before breakfast. I went to church and Mrs. Middleton came home with me. I was taken into the church today on probation. May God give me strength to walk in this path aright. I read a little and talked some during the afternoon. I did not feel very well. I wrote a little in the evening and went to bed early. Father is sixty two years old today. 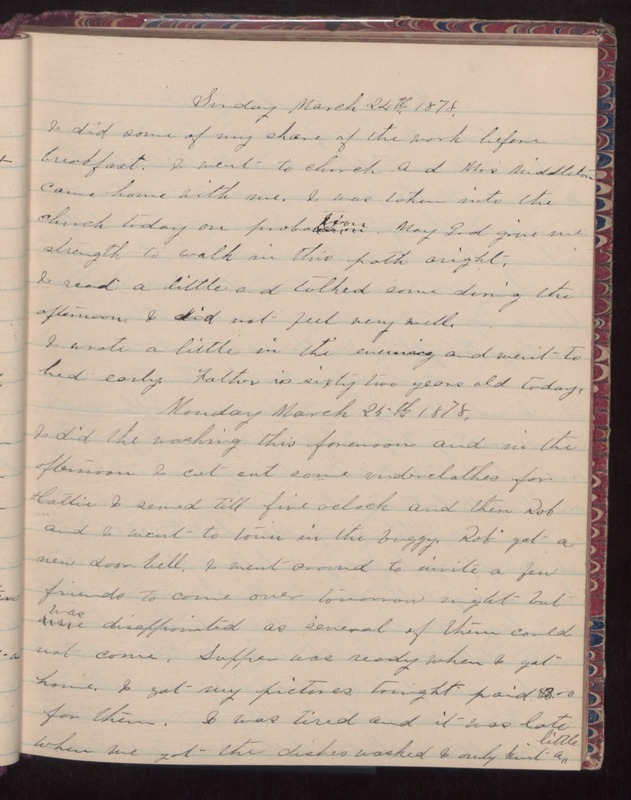 Monday March 25th 1878 I did the washing this forenoon and in the afternoon I cut out some underclothes for Hattie. I sewed till five oclock and then Rob and I went to town in the buggy. Rob got a new doorbell. I went around to invite a few friends to come over tomorrow night but was disappointed as several of them could not come. Supper was ready when I got home. I got my pictures tonight paid $8.00 for them. I was tired and it was late when we got the dishes washed. I only knit a little.